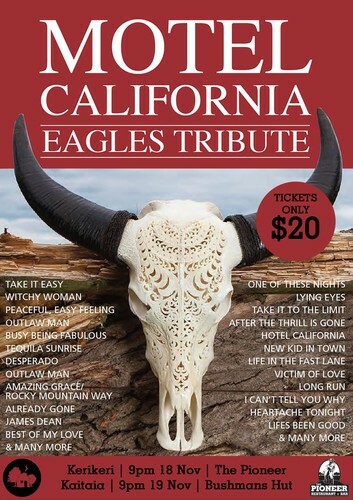 Come down and check out NZ's premiere Eagles Tribute Band - Motel California. They have just spent the year touring to sell out show's across the country, and now they are coming to the Far North. Come along and listen to all your favourites hits from one of the greatest bands to grace the stage. Tickets are available at the venue or online here . Tickets are limited - so don't miss out.